It was day 7 after an earthquake in Haiti. The world had been watching hopeless, warlike images broadcast from every news organization known. Gray. Everything is gray. Colorless dust clouds. That has been my observation. Pancaked buildings. Gray block piles of rubble. 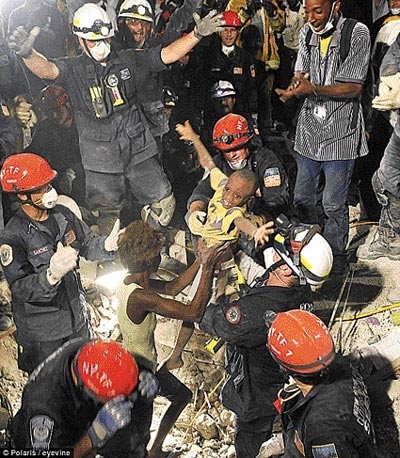 On day seven, rescuers from New York City, breathing through masks, reached into the rubble and pulled a 7 year old boy named Kiki into the sunlight. The boy spread his arms, palms to the sky and smiled one of the biggest smiles I have ever seen. Joy! Rescue! Freedom! Life! Can you imagine it? Seven days of being buried in darkness, dust and dirt had certainly left him thirsty, hungry and hopeless. And then, rescue! I see it as a picture of what Jesus the Rescuer does. He reaches into dark, crushing rubble and pulls people out to life. I think it is the buried person who appreciates The Rescuer most. Americans blame God for the rubble. Others see rubble as the reality of life and recognize Jesus as one who willingly steps into it bringing joy, hope and life. I have been humbled by people in poverty. Their faith is so much greater than mine. When I have worked to help people who have lost everything, I’ve been struck by their faith and come away knowing they have something I lack. Do you feel like your life is a pile of rubble that has you buried? Jesus is on the top of that pile digging feverishly to get to you to set you free and give you life. Or are you like me with a life that has challenges but is nowhere near the rubble others live in? I’ve found that serving those who have lost everything and feel buried has blessed and changed me more than it has changed them. Through being used by The Rescuer you discover purpose and worth that goes far beyond material riches. This entry was posted in change, Christianity, direction, Find God, Jesus, love, ministry, Poverty, religion, Uncategorized and tagged boy, grin, Haiti, Kiki, materialism, rescue, smile. Bookmark the permalink. It is so true that we have the responsibility and opportunity to demonstrate the Love of God when we dare follow Him into the homes of the broken. as someone who experienced disaster of an epic sort, i totally identify. in that moment, i felt Jesus as the rescuer, not the attacker. Of course, the fact that His people overwhelmingly rushed to help, being His Hands and Feet, made it a whole lot easier to have that outlook.